Google something today and then Google the same thing tomorrow. You might find that the word Google looks different, the search bar looks bigger, or more search results appear on each page. Whenever you search, chances are something will be different because Google is constantly changing - it is part of the Google business model. Before making changes, most companies run focus groups, create surveys, and hold endless meetings, but Google is the exact opposite. Google devises an idea, puts it out there, and waits to see what happens – they shoot first and ask questions second. The Google model is one of the most innovative and unique, but all good companies follow a business model that drives everything they do – including Major League Baseball teams. The George Steinbrenner Yankees had a model. Their model was to pursue the best players and empty their wallets to obtain them – win by outbidding their opponents. The Tampa Bay Rays, on the other hand, have one of the lowest payrolls. Their model is to trade stars before reaching free agency and lean on a superior farm system to remain competitive. The Miami Marlins, handcuffed by similar revenue constraints, follow a model in which they stockpile their young stars, hope to win a World Series, and then dump them all at once before free agency and start again from scratch. And then there is the famous Moneyball model with a focus on Sabermetrics, avoiding free agent contracts, and identifying undervalued players. The model for the Philadelphia Phillies is unclear. In part one of our five-part series, we focused on the importance of a business model for the Phillies. We examine in this article how the Phillies allowed their core players become a curse. Amaro’s decision to take advantage of a small window of opportunity with his tremendous core of players is not a faulty one. But there is a big distinction between aggressive and greedy. His individual decisions to land Lee, Halladay, Oswalt, and Pence were aggressive and mostly successful, but his decision to target all of them was greedy and showed the lack of a focused plan. Taken individually, many of his trades helped the ballclub. But viewed through a longer lens, he focused completely on short term success and ignored the long-term safety of the franchise. Cliff Lee and Roy Halladay became crucial pieces to winning three of the Phillies five division titles and created a buzz around town along with an amazing sellout streak. Those accomplishments cannot be ignored and deserve top billing on his resume, but a smudge reveals a darker truth. Through his four major trades, he surrendered 14 prospects and returned just 4, for a net loss of 10 prospects in three years. Again, short-term at the expense of long-term. In part one of this series, I introduced the importance of a business model for the Phillies and examined yesterday how the Phillies core has become a curse. Today we look at what should have happened with the core players. The Phillies core which was young, cheap, and under team control in 2008 is now old, expensive, and less productive. That same group that averaged 28 years/8 months in age, made $27 million total, and had an OPS of .861 in 2008 is now 33 years/8 months, making a total of $80 million, with an OPS of .741. The way to survive this simultaneous aging is simple: trade one of your stars. More specifically, Ruben Amaro should have traded Howard, Utley, or Rollins. I know how crazy it sounds: trade one of your superstars in the prime of his career on a team that is contending for a World Series. It takes a lot of guts, would have pissed a lot of people off, and might have cost them a chance of winning at least one more title. But it would be the responsible thing to do. It should have been part of their plan. June was a bit of a struggle for the Phillies who drop from .500 to begin the month to five games under .500 to finish the month. The Phillies were the definition of consistently inconsistent, winning three of four series against winning teams and losing four of five series to losing teams. The Phils keep drifting closer to becoming sellers before entering the last month before the trading deadline. The headline for last night's blowout loss on phillies.com was "Kendrick gets knocked around by Braves." Kendrick's line supports that claim, as KK allowed 6 runs in 5 innings. But the more appropriate headline might be "Kendrick struggles and defense lets him down." The box score shows only one Phillies error (Chase Utley), but it easily could have been three errors and two by Michael Young. If the fans were official scorers, they certainly would have charged Young with two E-5's. After his second misplay in the fifth, fans directed some boos towards Young and later delivered a mocking cheer when he made a play to end the fifth. The Phillies defense is tied for 14th in baseball this season and its effect on the team cannot be overlooked. The Phillies have three starters who are defensive liabilities (Howard, Michael Young, and Delmon Young) and two players who can be considered slightly below average defenders (Utley and Revere). Hard to believe Domonic Brown is probably the third best fielder on the team! 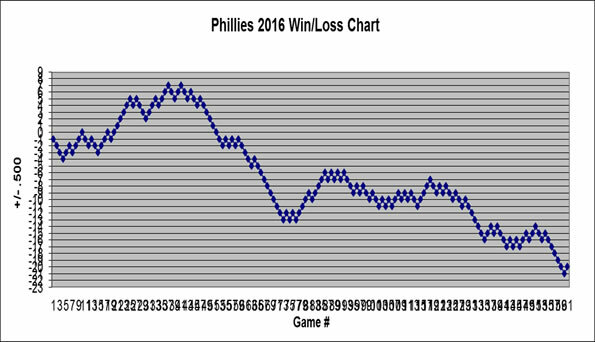 The decline of the Phillies as a team coincides perfectly with a decline defensively. The Phillies averaged the fourth ranked defense in baseball (4.2) during their five straight playoff seasons. That ranking dropped to 13th last season and 14th this season. We have reached article number four on the Phillies business plan. I already discussed the value of a business plan, how the Phillies ignored a plan by trading too many prospects, and why Ruben should have traded Howard, Utley, or Rollins. Through their actions, the Phillies created the team you see today: old, expensive, and ineffective. Ruben Amaro not only allowed his core to age, but he made matters worse by adding more elderly players. In 2009, he elected to replace Pat Burrell with 37-year-old Raul Ibanez to a three year deal which would make him 39 in 2011. When he needed a third baseman in 2010 he signed a 34-year-old Placido Polanco who would be 36 in 2012. He reasoned in both cases that he wanted to offer two years, but in order to get his guy he needed to add an additional season. He didn’t have to do anything. I’m no business genius, but to me intentionally wasting a year on a contract is not a good deal. You could argue that either acquisition was the best option available at the time, but this brings us back to the importance of having a business plan that drives your decisions and maintains your focus on the horizon. A business plan could have helped them avoid a position where they were forced to sign a contract they were not comfortable signing. While no team has control over which players become free agents, teams can do their best to predict the potential free agent market. The Phillies have 17 days to potentially decide the fate of the Phillies organization for the next decade. Oh, what to do at the deadline? Go for broke and trade your few remaining prospects and salvage your last real shot with this core? Bank on Charlie’s second half success and stand pat or make a minor move? Trade a part for a part by moving a minor piece like Michael Young for a reliever? Only trade Chase Utley, the one free agent after the season with tangible value? Or, sell the entire farm? It seems like a difficult decision, but it should not be that difficult if the Phils have a business plan and are willing to stick to it, which I have already made abundantly clear in the first four articles. The Eagles made it their organizational philosophy to avoid signing players over the age of 30. They did not always adhere to it but they rarely wavered, regardless of any backlash from the media or fans. If the Phillies have a clear idea of their vision of the now and the future and are willing to stick to it, they can focus in on the specific trades. The Phillies are fun to watch right now, but they are creating some sleepless nights for Ruben Amaro and company. The players have given plenty of reasons why the Phillies should be buyers rather than sellers: a .500 record and 5.5 games back in the Wild Card, Charlie’s amazing second half dominance, the vulnerability of the Braves, and the potential for Cole Hamels to get hot. We could even look to the 1980 and 1983 Phillies as examples of older teams with surprising finishes. There are also many reasons to sell, sell, sell: four key pieces on the disabled list, Utley’s injury history, nine players over 30, a .500 or better record for just six games all season, a frightening bullpen, and a weak farm system. Let’s be honest with ourselves and admit that this is not a World Series team. Sure, it is entirely possible the Phillies have one more run in them, but odds are too unfavorable in comparison to what they lose by not trading. That is why the Phillies must be sellers. It will be an extremely unpopular move if the Phils continue to play well, but to waste any opportunity for future improvement is irresponsible. What will Phillies roster look like if they sell at trading deadline? I want you to do a little GM exercise today. Copy and paste the Phillies active roster into a Word Document today and don’t touch it for 12 days. Take a look again on Aug 1 and if that roster has not changed, you have successfully performed your first magic trick. The Phillies will be buyers or sellers in some way, shape, or form at the trading deadline, but they aren’t likely to be nonexistent onlookers. It becomes more likely with each Phillies win that they will be buyers, but let’s prepare ourselves for the doomsday scenario (as I have) and assume the Phils sell the farm. Let’s pretend that the Phillies trade pretty much everyone (Lee, Utley, Rollins, Ruiz, Kendrick, Papelbon, and Michael Young). Consider this your first therapy session. Yesterday, I discussed what the Phillies roster might look like if they were major sellers at the trading deadline. The Inquirer just announced their list of the top 25 Phillies prospects and today let's take a closer look at some of the players we may or may not be seeing in Philadelphia soon. I'm not a minor league expert , so my intentions here are just to give you a quick overview of the names and stats of the key farm players. Just call this the Cliff's Notes version. But if you are looking for an exhaustive analysis of each prospect, read the philly.com posting or visit the phillies.com top 20 rankings (although their comments are prior to this season) if you want an exhaustive analysis. For our purposes here I separated everyone into the Haves and Have-Nots. The Phillies’ ten game season began on Friday at Citi Field. Ten games between the all-star break and the trading deadline that will determine whether the Phillies keep their roster mainly intact or break it apart piece by piece. Ten games to decide their fate. But hold on a second. The Phillies played two different teams in New York this weekend. They split two games with the 31-43 (.419) New York Mets and then lost a one-game series to the 12-8 (.600) Matt Harvey Mets. The team the Phillies faced on Sunday might have been the best team in baseball – it is hard to lose with Matt Harvey on the mound, especially on Sunday when he was about as close to unhittable as a pitcher gets. There is no escaping the importance of every Phillies win at this point of the season, but a split with the Mets and a loss to Matt Harvey does not signal the end of the season. What it does signal is that the Phillies not only need to win two straight series against first place clubs, but they probably have to sweep one of them. If the Phillies take two of three from the Cardinals and Tigers they will be one game over .500 before playing their “last game” against the Giants – that is certainly not good enough for me to bet on the 2013 Phillies. But sweeping a series and taking five of six puts them 4 games above .500 before the Giants. That, along with five wins against great teams at a crucial moment might force Ruben to go for broke. Boy, how things have changed in Phillies land. In just one week the Phillies went from a hot hand and likely buyers to ice cold and almost guaranteed sellers. Exactly one week ago today, the Phillies destroyed a hot Mets pitcher for their ninth win in 12 games to push their record to one game above .500, climbing within 5.5 games of Atlanta and 5.5 games back in the Wild Card race. Fast forward one week and the Phillies have lost six straight, are 5 games under .500, and find themselves 9 games behind the Braves and 9.5 games out in the Wild Card. The path to the playoffs is now a very dark road. Here is what the Phillies need to do to reach the playoffs. The distance between Philadelphia and the city of St. Louis is 889 miles, roughly 14 hours by car and, as was discovered this week, immeasurably further when measured in ballclubs. The St. Louis Cardinals have dashed Phillies dreams before: in 1964 when they took the NL East title from the Phillies amidst the greatest collapse in baseball history; in 2011 when a 90-win Cardinals team disposed of a 102-win Phillies club in the NLDS; and this week when they unofficially ended the Phillies 2013 season. The Phillies arrived in St. Louis with a slight glimmer of playoff hopes and left without a flicker. In their three-game sweep in which they outscored the Phillies 18-5, the Cardinals made the distance between a winning ballclub and a losing one abundantly clear. Anyone who suffered through each torturous loss knew the difference. In the home Cardinals dugout was a disciplined, focused, fundamentally sound team. In the visiting Phillies dugout was an undisciplined team, lacking in talent, without any sense of cohesion. The Cardinals did all of the little things right. They worked the count, moved baserunners, delivered clutch hits, and fielded the ball cleanly, which are ironically all things with which the Phillies have struggled with all season. It's been a few days since the Phillies played the Cardinals, but it still seems pertinent to point out the drastic differences between the two clubs. Tomorrow has the makings of a worst-case disaster scenario for the Phils. The biggest advantage to having a bad ballclub on July 31 is that you can start the rebuilding process and get value for players who otherwise are essentially wasting their talents on your team. The Phillies have several players that fit that category, including Chase Utley, Jimmy Rollins, Jonathan Papelbon, Cliff Lee, Michael Young, and Carlos Ruiz. The Phillies certainly do not look like a playoff team this team or next year, they have a high payroll, diminishing fan support, and not much of a farm system. If the Phillies want to compete, it would seem they need prospects. The fear of this blogger was that the Phillies would hang around the playoff race and not get anything back for guys like Utley and Papelbon. Well, welcome to any even worse fate. What if the Phillies stink and trade nobody at the deadline? Earlier this year, that seemed impossible, but now it is becoming more and more likely. The Phillies are asking for the moon in return for Lee. Teams have little interested in an expensive, loudmouth closer with an inflated salary. They are trying to re-sign Chase Utley. Chooch has no value and the Phils have nobody waiting to replace him. Jimmy won't waive his no-trade clause and I even heard a report that Michael Young won't, either. So we will be stuck with a bad team this year and basically the same expensive, old team next year with no new young blood with which to replace them.